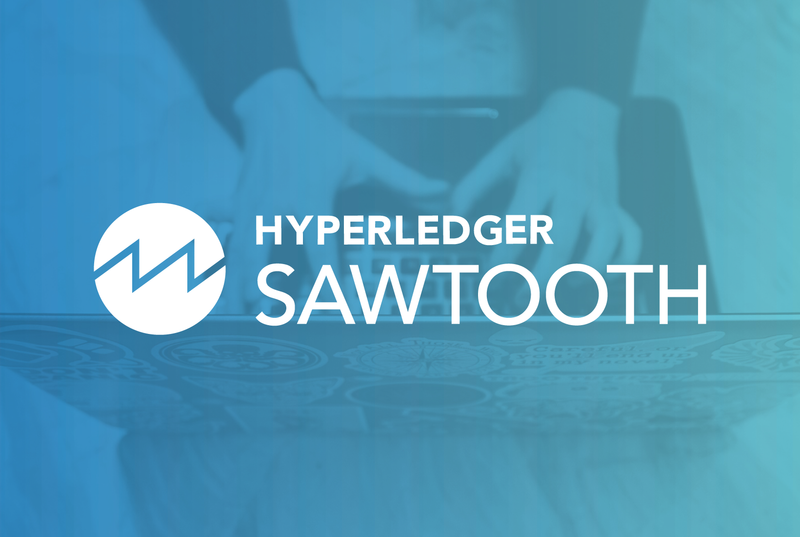 In October 2017, the Hyperledger Sawtooth team started to implement a new consensus algorithm for Hyperledger Sawtooth. We wanted a voting-based algorithm with finality, which is very different from the Proof of Elapsed Time (PoET) consensus algorithm that has been closely associated with Hyperledger Sawtooth since its start. This project presented a number of challenges and opportunities. The greatest challenge in implementing this new consensus algorithm with Sawtooth was in breaking apart an architecture that has been heavily influenced by a lottery-based consensus algorithm with forking. A lot of refactoring and architectural work went into making both voting-based and lottery-based algorithms work well with Sawtooth. However, the opportunities that we discovered from this effort made overcoming these challenges more than worth it. We designed a new consensus API that simplifies the process of adding new consensus algorithms while continuing to support the existing PoET and Dev mode consensus algorithms. We completed the first prototype validator with consensus API support in July 2018. Since then, we have been able to implement two new voting-based consensus algorithms for the Hyperledger Sawtooth platform: Raft and PBFT. We are pleased to announce that the Sawtooth 1.1 release supports the new consensus API. This release also includes consensus SDKs to make it easier to implement new consensus algorithms. The new consensus architecture moves consensus functionality to a separate process, called a consensus engine, and provides an API for each consensus engine to interact with the validator. Moving the consensus functionality to a separate process allows consensus engines to be implemented in a variety of languages. Currently, SDKs are available for Python and Rust and have been used to create the consensus engines for PoET, PBFT, and Raft. Multi-language support is important beyond providing a choice for implementing a new consensus engine. This support makes it much easier to reuse existing implementations of consensus algorithms. For example, the Sawtooth Raft consensus engine is built on the pingcap/raft-rs library. We were able to easily integrate this well-regarded Raft library, which is itself a port from the widely-used etcd Raft library. As SDKs for additional languages are built on top of the consensus API, it will be possible to add more and more consensus algorithms into Hyperledger Sawtooth. For example, a consensus SDK for Go would bring existing implementations such as Hyperledger Labs’ MinBFT one step closer to being compatible with Sawtooth. 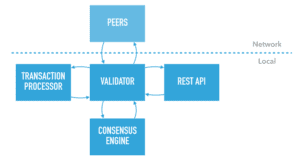 The consensus API is centered around a new consensus engine abstraction that handles consensus-specific functionality. A consensus engine is a separate process that interacts with the validator through the consensus API using protobuf messages and ZMQ. Service: A pair of (request, response) messages that allow a consensus engine to send commands to the validator and receive information back. For example, a consensus engine can instruct the validator to commit a block or request an on-chain setting from a specific block. Services are synchronous and on-demand. Updates: Information that the validator sends to a consensus engine, such as the arrival of a new block or receipt of a new consensus message from a peer. Updates are sent asynchronously as they occur. Although you could use the API directly to implement a new consensus engine, the recommended interface is a consensus SDK. The SDK provides several useful classes that make it easier to implement a consensus engine. Sawtooth currently provides consensus SDKs for Python and Rust. We have used these SDKs to create the consensus engines for the PoET engine (Python), PBFT engine (Rust), and Raft engine (Rust). These SDKs have a consistent design with an abstract Engine class, an engine Driver, and a validator Service. The abstract Engine class provides a clear starting point for new consensus engine implementations. If you plan to write your own consensus SDK, we recommend conforming to this design. One of the most important decisions for a distributed ledger application is the choice of consensus. By opening up this interface, we hope that each application built on Hyperledger Sawtooth can select the consensus algorithm that suits it best. To check out the new Sawtooth consensus engines, please see sawtooth-raft and sawtooth-pbft. For design information, take a look at the Consensus Engine API RFC. To get started writing your own consensus engine, see the Python Consensus SDK or Rust Consensus SDK. For all of the hype around blockchain, most businesses are barely tinkering with it right now – if they’re doing anything at all. A recent Gartner survey of CIOs found that 43 percent of respondents said blockchain was on their radar but they had no concrete plans in the works, while 34 percent said they simply weren’t interested. A scant one percent of CIOs reported any kind of blockchain adoption in their organization. Credit card giant American Express has joined the Linux Foundation-led open-source cross-industry blockchain working group, the Hyperledger Project. In yet another noted example of the traditional financial services industry turning to Fintech’s poster child in blockchain technology, American Express has joined the Hyperledger Project as a ‘Premier’ member. SAN FRANCISCO, CA – (December 28, 2016) – Hyperledger Project, a collaborative cross-industry effort created to advance blockchain technology, announced today that eight new members have joined the project to help create an open standard for distributed ledgers for a new generation of transactional applications. Last month, Hyperledger announced it reached 100 active members in less than one year, a huge milestone for the open source project, hosted by The Linux Foundation. Hyperledger aims to enable organizations to build robust, industry-specific applications, platforms and hardware systems to support their individual business transactions by creating an enterprise grade, open source distributed ledger framework and code base. The latest members include: CA Technologies, Factom Foundation, Hashed Health, Koscom, LedgerDomain, Lykke, Sovrin Foundation and Swisscom. We’re pleased to announce that the distributed ledger project, Iroha, has been accepted into incubation status under Hyperledger. Originally developed by Hyperledger member company, Soramitsu, Iroha was inspired by the Fabric architecture and aims to provide a development environment where C++, web, and mobile application developers can contribute to the Hyperledger Project. Iroha seeks to complement Fabric, Sawtooth Lake, and other potential projects, by creating reusable components in C++ that can be called from languages such as Go. In this way, Iroha is additive to existing projects and the long term goal is to realize a robust library of reusable components that can be selected and used freely by those running distributed ledgers on Hyperledger technology. Provide a framework to experiment with new APIs and consensus algorithms that could potentially be incorporated into Fabric in the future. Currently, the Hyperledger Project lacks an infrastructure project written in C++, thus limiting the potential developers who can contribute. Also, there is not currently a strong focus on user interaction or mobile applications, though both are necessary for the realization of the widespread use of distributed ledger technology. Iroha aims to rectify both of these points, bringing in more developers while providing libraries for mobile user interface development. Who will work on Iroha? Soramitsu has committed several full time engineers to the project. Makoto Takemiya of Soramitsu is the initial project maintainer, along with six other engineers at Soramitsu. 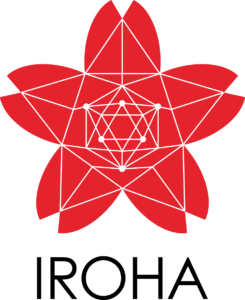 Besides Soramitsu, the co-sponsors of the proposal and other Hyperledger members are considering committing resources to work on Iroha including Toshiya Cho of Hitachi, Takahiro Inaba of NTT Data, and Mark Smargon of Colu. Soramitsu is also doing collaborative research with The University of Tokyo, The University of Aizu, and Center for Global Communications (GLOCOM, below) of International University of Japan. From the University of Tokyo, Hideyuki Tanaka will consider economics use cases with Iroha. From The University of Aizu, Yasushi Fujii will explore business use cases with Iroha. From GLOCOM, Soichiro Takagi will consider economics and scientific research using Iroha. Working with community members and use case partners, we would like to continue to improve upon Iroha and have it reach and active project stage in the future. The end goal is to realize a suite of components that can be freely interoperable with other Hyperledger projects. JPMorgan has unveiled what it calls a “distributed cryptoledger”, presented during this week’s meeting of the technical steering committee for the Linux Foundation-led open-source Hyperledger Project.